Excess salt intake can be hazardous to dogs. Not only can it cause increased thirst and urination, but it can also even cause seizures. Don't feed your pet salty foods, and if you keep salt or salty foods in your home, make sure your pet never has access to them. If your dog consumes salt or even just consumes foods that are rich in salt, it can lead to sodium ion toxicity. If a dog consumes a lot of salt, which is a combination of sodium and chloride, the sodium spreads throughout his body. Once it gets to his central nervous system and brain, tissues expand and water accumulates. When the brain expands, pressure builds. This can lead to serious neurological problems. 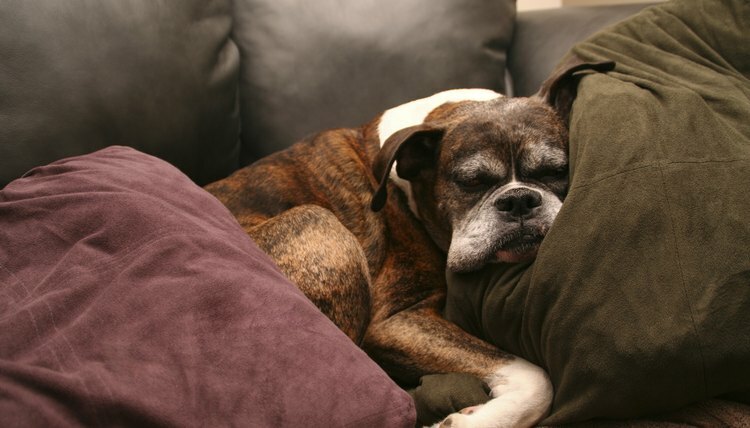 The accumulation of pressure can trigger seizures in dogs. It can also lead to coma and death. Dogs can develop salt poisoning simply by ingesting salt or salty food. If your dog is of medium size, it doesn't even take 1/2 cup for salt poisoning to occur. Since salt toxicity is a potentially life-threatening situation, owners must take precautions to ensure their dogs don't ingest it. You can protect your pet from salt poisoning by putting salty foods away immediately when you're done eating them. You can also do so by keeping the pantries in your kitchen shut. If you want to make sure your dog can't get to salty foods in the trash can, invest in one that's equipped with a convenient lid lock. Remember, too, that salt isn't only found in food; rock salt, homemade play dough and paint balls all contain salt. In addition to seizures, possible signs of salt toxicity in dogs include excessive thirst and urination, reduced energy, diarrhea, vomiting, raised body temperatures, muscle tremors, depression, unusual fluid buildup in the body, walking drunk and lack of appetite. If you're worried that your pet is experiencing a seizure from salt poisoning, look out for possible seizure symptoms such as shaking, facial twitching, collapsing while barking, passing stools, urinating, teeth clenching, hiding, bewilderment, unsteadiness and staring into the distance. Veterinarians often diagnose salt toxicity in animals by assessing clinical signs and performing clinical pathology tests. They treat salt poisoning in dogs with IV fluid administration, supportive care, brain swelling and dehydration management and electrolyte assessment. Dogs who haven't yet started to exhibit clinical signs of poisoning are sometimes treated with emetics, medications that encourage vomiting. Rapid veterinary treatment can increase your dogs' chances of recovering and surviving. If you have any reason to think your dog might be experiencing salt poisoning, whether from observing signs of seizures or anything else, seek emergency veterinary attention for him immediately. Fitness Unleashed! ; Marty Becker, D.V.M. and Robert Kushner, M.D.